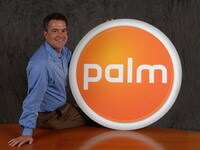 Palm Inc. shareholders are about to sell part of the company to a private equity firm and a change in the board's makeup. Under the capital restructuring, Elevation Partners will pay $325 million (234 million EUR) in cash for a 25 percent stake in the company, and Palm will pay a special distribution of $9 per share, or about $940 million (677 million EUR) in cash, to shareholders for their reduction in ownership. Palm, the maker of Treo smart phones, will also get a new executive board chair - Jonathan Rubinstein, the former head of Apple Inc.'s iPod division - after the transaction closes. Elevation partners Fred Anderson, Apple's former chief financial officer, and Roger McNamee, a veteran Silicon Valley investor, will also join the board, replacing outgoing directors Eric Benhamou and D. Scott Mercer. Rubinstein, who ran the iPod division at Apple from 2004 to 2006 and led creation of Apple's iMac computer before that, was part of the executive team that joined Apple after Steve Jobs returned to run the company. Palm says it is looking to Rubinstein to help recruit and retain the talent it needs to create innovative products and to bring them to market quickly. Palm was considered a pioneer - first in personal digital assistants and then in smart phones - but has lost its luster the past year as competitors introduced sleeker handsets. The Treo, many users complain, now seems stale. The mounting competition stung Palm in the last quarter, when the Sunnyvale-based company's profits plunged by 43 percent while rivals such as Research in Motion Ltd., maker of the BlackBerry, saw its earnings grow 73 percent. Last week, Palm pulled back the Foleo, a laptop-like companion to smart phones that was widely panned by analysts and reviewers. The product was slated to hit the market soon but Palm officials said they needed to do more work on it first.